Today, we're launching a new initiative from our think-tank, The Copia Institute. The European Commission is holding a public consultation on new regulations for the internet, and the only way to send comments is through a painfully long and oblique online survey. Unfortunately, thanks to those five pages of small print and confusing questions, most people don't seem to have realized just how big a deal this consultation is — and it only runs until December 30th. The new regulations that are being considered include a long list of things that we've fought hard against here at Techdirt. In general, it all focuses on "intermediary liability" — the dismantling of safe harbors and creation of new regulations that hold online services accountable for the actions of their users. Apart from the obvious common sense objection that this is clearly putting the blame in the wrong place, we know it has all sorts of negative effects: it encourages services to spy on the actions of their users, it turns providers into de facto judges and squeezes out free speech safeguards like fair use, it leads to filtering and takedown systems that inevitably target lots of legitimate content... the list, as our readers know, goes on and on. We discussed the issue in detail last week on our podcast. This isn't just an issue for Europe. Currently, the EU's rules around intermediary liability are largely in line with the safe harbor approach in the US, and changing this could impact every online service that has European users, everyone who wants to share content internationally or make use of services from the EU, and generally everyone who cares about innovation, privacy, competition and free speech on the global internet. 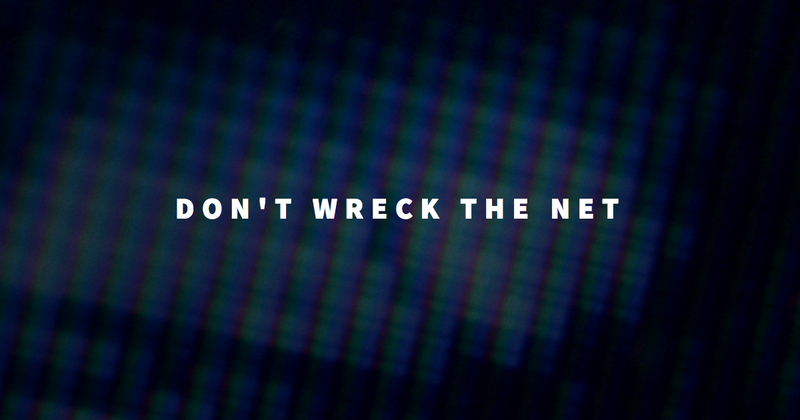 So we're asking everyone to brave the nightmarish online survey and speak up against these new regulations, and to help we've created the Don't Wreck The Net campaign and survey survival guide. There we outline the core issues at stake, and offer some help orienting yourself in the survey and understanding what the bureaucratically-worded questions are getting at. Again, it's really important that people respond to this public consultation. Not only is the survey a pain, the details strongly indicate that the European Commission really wants to enact some new regulations — often, it only gives you space for additional comment when you are criticizing the existing framework, but not when you are defending it. You can bet that lots of folks from the copyright industries have submitted their responses, no doubt calling for robust new notice-and-staydown rules and proactive monitoring requirements. This can't be the only message the Commission hears.